Australia is perhaps the ideal incubator for ideas, invectives, and occasionally, idiocies regarding a foreign policy challenge facing many if not most states today—how to navigate the disruptive transition occasioned by America’s decline and China’s rise. Relatively secure in its geographic isolation, with insufficient material capabilities either to look after itself or tip the global balance of power, but with genuine interests in how events unfold within and beyond its backyard, policymakers and pundits in particular have been free to loudly and loquaciously wring their hands with concern at the invidious foreign policy tradeoffs Australia faces. This debate, opened and eloquently prosecuted for most of the 2010s by former senior defense official and now Australian National University Professor Hugh White,1 provides a detailed and at times surprisingly candid insight into how open societies struggle with this dilemma. The unexpected election of Donald Trump merely frothed the already turbulent waters of this maturing debate, but also raised the prospect that policymakers might, finally, face some hard choices in the near future—choices that politicians have consistently claimed Australia would not need to make for a long time. In a speech before the nation’s 113 heads of diplomatic missions—whom, in an unprecedented move, were temporarily recalled to Canberra in March to contribute to the white paper drafting process—Foreign Minister Julie Bishop reiterated these three “core tenets that guide Australia’s foreign policy.”4 As is usually the case, the first pillar listed by the foreign minister was the US alliance, which remains “fundamental to [Australia’s] economic and strategic security.”5 The tendency to list the alliance first reflects a long-standing theme in Australian foreign and security policy: the need for what former Prime Minister Robert Menzies sincerely described as “great and powerful friends.”6 This requirement was born out of the concern felt by governments that Australia’s vast geographic size and small population—combined with the fact that it was located far away from its “Anglosphere” brethren and surrounded by vastly different and unfamiliar neighbors—left its security in a precarious position.7 As such, alliance management has been central since the early days of Federation, with governments looking first to Great Britain and later to the United States as the effective guarantors of Australia’s national security. The primary challenge for policymakers in maintaining the alliance bargain is navigating what scholars of alliance politics cast as the twin risks of abandonment and entrapment—the former referring to the possibility that a partner will fail to make good on its alliance commitments when a state is confronted with a threat, and the latter to the chance that a partner will drag a state into a conflict in which it does not, or only partially, shares an interest.10 Typically fears of abandonment are felt by protégés and fears of entrapment by more powerful states; however, recent promising research correctly identifies the possibility that weaker states may fear both risks equally.11 Thus, the first question one must ask about the impact of President Trump on the first pillar of Australian foreign policy is whether Canberra’s calculations about these risks have changed and, if so, what is being or can be done in response. As foreshadowed earlier, the fear of abandonment has been a long-standing feature of Australian strategic thinking since European settlement. An authoritative review of Australian foreign policy since the Second World War recently published by former diplomat and intelligence chief Allan Gyngell concludes that fear has been the central “motivating force of Australia’s international engagement,”12 and many Australian experts continue to underline that the possibility of abandonment by the United States should be of greatest concern to Canberra.13 As such, it is no surprise that Trump’s foreign policy statements are generating some anxiety amongst Australian policymakers. Nevertheless, fears of abandonment may linger because some view the United States under Trump as a partner of diminished credibility. For the first time since the alliance was formed, Canberra must deal with an administration whose commitment to shared values, which have historically been “the building blocks of trust,” may not be absolute.18 Furthermore, as Stephen Walt notes, alliances often dissolve when members question the genuineness of their partner’s commitment to providing assistance.19 The fact that Trump espouses a transactional worldview means that he is more likely to act only when he perceives it is in his interest to do so, rather than to simply preserve the United States’ reputation. As such, while concerns about abandonment are not acute, they are greater now in the absence of a US president with a clear commitment to upholding the liberal, rules-based international order and the US leadership in it. Similarly, Trump’s proposition that “all options are on the table” when dealing with North Korea—and threat of “fire and fury like the world has never seen”—inspired lively debate amongst senior Australian politicians about the increased risk of Canberra being “dragged into a conflict” on the Korean Peninsula by Washington.21 Such concerns intensified when Pyongyang proceeded to identify Australia as a potential target for future nuclear strikes if it were to continue “blindly and zealously toeing the US line”.22 To the extent that Washington is almost certain to ask Canberra for support in any such contingency, the greater risk of these conflicts under a more aggressive and/or erratic Trump has generated genuine concern about entrapment in Australia. With heightened fears of both abandonment and entrapment, the question then becomes whether and how Canberra can mitigate those risks. Here alliance scholarship offers few answers for protégé states because they operate under such significant structural constraints—too weak to go at it alone, and usually unwilling to align (‘bandwagon’) with the source of the security threat.23 Excluding such extreme options, Canberra has at least three options. Ultimately the first two options—distancing and embracing—both appear unpalatable. Not only do they entail significant practical costs, they involve committing to a judgment (and its attendant risks) regarding whether entrapment or abandonment is the greater concern, when the evidence to date is not conclusive. The third option, then, is for Australia to take a middle ground, essentially muddling through and doing its utmost to avoid making a clear choice during Trump’s presidency. As beige as this option sounds, it is the least unappealing strategic play and an approach in which Australian policymakers have some experience. Indeed, the history of Australian foreign policy—in the words of Alan Gyngell—has often looked “like a chronicle of efforts to avoid unwanted choices.”35 Fortunately, Canberra appears still to have the strategic space to maintain this approach. In addition to strong support from Washington, deep operational ties provide additional ballast.40 While some have noted that there is room for greater political institutionalization (à la NATO),41 there is no question that the cooperation that has emerged out of the alliance framework—such as the development of joint facilities, extensive embedding of Australian Defence Force personnel within the US military, regular rotation of US marines through bases in northern Australia, high-level intelligence sharing, and significant investment in US military technology systems—serve to align the two states’ interests more closely, bolster interoperability and build dense networks at the individual level, thereby buttressing the underlying security commitment in a positive feedback loop. Accordingly, with robust political support for the alliance in Washington and no evidence of any substantive strategic reorientation being sought by Trump, holding the line (if occasionally one’s nose) might not only be the least-unpalatable option from a political standpoint, but also the optimal strategy. When it comes to the first pillar of Australian foreign policy, therefore, the status quo remains the most likely medium-term equilibrium. Nevertheless, that is not to say that the new president has had no impact on Australian policymaking vis-à-vis the alliance. Despite an expectation that Trump will request that Australia join US freedom of navigation operations in the South China Sea and advocacy from national commentators that Canberra accept,42 Australia did not participate in either of the first two operations that occurred in May and July. While this outcome may have been the same had Hilary Clinton been president, one cannot discount the possibility that distaste for Trump is further reducing enthusiasm for the risk that FONOPs present. More recently, Australia’s decision to unilaterally suspend air operations over Syria for 48 hours after Russia warned it would view coalition aircraft as potential “targets” following the shooting down of a Syrian jet by US forces also raises questions.43 While the counterfactual is unknowable and Australia’s tactical military operations have not always marched in lockstep with the United States, one wonders whether this would have happened under presidents Obama or Bush, when decision-makers would have been more confident that risky tactical operations were nevertheless part of a well-considered and coherent military strategy. Finally, to the extent that Trump’s behavior continues to be erratic and uncouth, alliance skeptics in the public sphere have abundant ammunition to continue their campaign to shift long-term public opinion. Any impact on the regional engagement pillar is best interrogated by assessing how the new president has affected Australian policymaking primarily vis-à-vis China,44 but also other major regional partners. Should Australia’s engagement toward China change in light of Trump? This is not a straightforward question since it is already in Canberra’s interest to maximize engagement with Beijing, both as Australia’s largest trading partner and as the most significant regional actor. Doing more, and making a decisive “pivot” in Beijing’s direction would mean accommodating China’s interests on one or more contentious issues in which Australia’s largest trading partner is at odds with Australia’s security provider—the United States. Almost by definition, such a move would not be risk free. However, the costs and risks associated with such policy shifts are real. Closer ties with China are complicated by a variety of scandals that have emerged in the past 12 months regarding allegations of espionage, Beijing exercising “unreasonable” influence over Australian Chinese communities and Chinese language media, and China-linked donations seeking to secure greater access to and influence over Australian political processes.50 Furthermore, the “China Choice” debate in Australia is maturing. It is no longer simply about balancing economics and security interests, or auguring the rise and decline of great powers; instead, there is now a deeper recognition that accommodating China, on some level, inevitably leads to stronger acquiescence towards the principles, practices, and values found in China’s approach to governance, political economy, and international relations. It is ever apparent that the world did not remain static when Trump was elected. If China was given the opportunity to lead by that surprising outcome, it has only partially embraced it. For every positive step forward that Beijing has taken towards becoming a “responsible stakeholder”—be that President Xi Jinping’s staunch defense of free trade and open markets at the World Economic Forum in Davos, or stepping up to lead the fight against climate change—it seems that some other decision or act has served to undermine its leadership credentials. For example, Australians viewed Chinese efforts to use economic coercion to deter South Korea from deploying US missile defense systems as a warning to all of the potential costs of losing economic ties with Beijing.55 In addition, Australian government officials expressed shock at the decision of a Chinese delegation to loudly protest the attendance of a Taiwanese delegation at an international conference on conflict diamonds hosted in Perth.56 Such actions ensure that Australians remain ambivalent towards—and perhaps somewhat fearful of—the prospect of Chinese global leadership. In this light, the Canberra’s response to Trump is not jumping into bed with China. Looking beyond China, the uncertainty and unpredictability introduced by Trump’s election has inspired advocates of Australia diversifying its defense and security relations with other major partners in the region.57 The logic of diversification would see Australia pursuing a dual strategy of fostering continued US leadership by bolstering cooperation with Washington’s allies, while also taking precautions against the possibility of US retrenchment through strengthening new partnerships and taking a more active leadership role in contributing to regional stability. Indeed, at recent summits, Australia has continued to enhance its bilateral and multilateral cooperation with major partners including India, Japan, and core ASEAN members such as Indonesia and Singapore. Nevertheless, as with the first pillar, it is impossible to argue that Trump’s presidency has had zero impact on Australia’s approach to regional engagement. In particular, while Australian policymakers are still likely to try and salvage the TPP, their disappointment with Trump’s withdrawal from the trade agreement will inevitably spark increased economic cooperation under Chinese leadership. Australia has strong incentives to devote greater resources to concluding RCEP negotiations before it hosts an ASEAN leaders summit in Sydney next March,62 potentially putting Australia within a mega-regional free trade agreement that excludes the United States sooner than would have been expected had the TPP gone ahead.63 Similarly, as China continues to provide much-needed infrastructure and industry investment in Australia’s northern regions, commentators increasingly suspect that Canberra might be pulled into the gravitational orbit of Beijing’s One Belt One Road (OBOR) initiative.64 While the government has yet to take the opportunity to formally link its Northern Australia Project with OBOR, Trade Minister Steve Ciobo has acknowledged the government sees “merit” and “opportunities for collaboration” stemming from the initiative.65 Ultimately, just as Australia eventually came to join the China-led Asian Infrastructure Investment Bank (AIIB), perhaps Trump’s ‘America First’ trade policies would eventually push Canberra to become an official OBOR partner. However, as these proposals suggest, any meaningful action in defending the rules-based international order will necessarily entail bearing very real financial costs in aid, organizational, and diplomatic funding, and more poignantly, the human costs of deploying troops on peacekeeping missions. This is a tough sell domestically, as there will always be those who claim that local funding for areas like health, education, and employment should always take absolute priority. The long-term capacity of the Department of Foreign Affairs and Trade is eroding via continual “efficiency dividend” funding cuts, and there seems to be no appetite among the major parties to reverse this trend.73 While the Australian public is not blind to global challenges, votes are generally only lost, and rarely won, on matters of foreign policy. Add to this mix a populist backlash within western democracies against the principles and institutions of liberal internationalism, and no one should expect the nation’s political leaders to make bold proposals to expend more blood and treasure far from Australia’s shores. Doing so is only ever countenanced during or in the aftermath of great catastrophes like war, and the threat currently facing the system in which the “lucky country” has flourished is not, yet, of that magnitude. Nevertheless, much like the challenge of climate change, the threat is real—and grave—and if there was ever a peacetime occasion for Australia’s leaders to make the case to their people for the need to commit valuable resources in aid of a cause that will surely affect successive generations, it is surely approaching. Yet despite such reevaluations, it is unlikely that the release of Australia’s new foreign policy white paper later in the year will reveal any radical new approaches to the way in which the nation engages the alliance, the region, or the world. 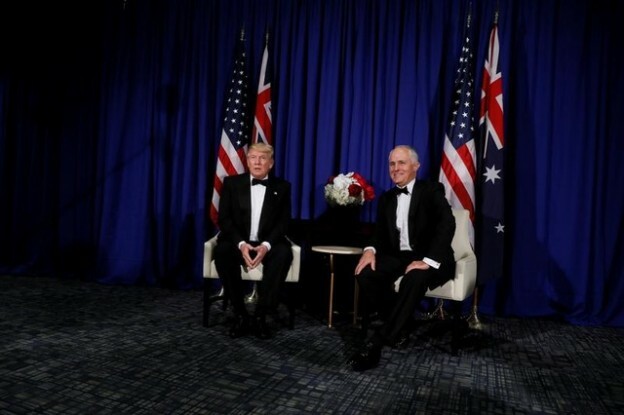 Personalities aside, the fundamental interests of both the United States and Australia remain closely aligned and Canberra continues to accrue significant benefits from the alliance. If, as we have suggested in this piece, Australia is in the unenviable position of navigating increased fears of both abandonment and entrapment under Trump, while strategies of distancing or embracing are both unacceptably costly and unpalatable. Finally, in terms of the third pillar of Australian foreign policy, one might hope that the seemingly genuine threat that Trump’s approach to world politics poses to the global rules-based order will prompt Australian leaders to make the case to their people for reinvigorating the country’s commitment to supporting the system under which their country has benefitted so enormously. While allocating more energy, time, and resources to things other than the basic daily concerns of Australian voters is never going to be popular, the global order—and the rules, norms, and values that it represents—is more fragile than at any other point since its inception, and in need of all the help it can get. * The authors wish to acknowledge the research assistance of Dominique Yap. 1. Hugh White, “Power Shift: Australia’s Future Between Washington and Beijing,” Quarterly Essay 39 (2010): 1-74. 2. Allan Gyngell, “Emerging Challenges for Australian Foreign Policy,” Australian Journal of International Affairs 68, no. 4 (2014): 381-385. 3. Malcolm Turnbull, “Keynote address 16th IISS Asia Security Summit,” speech delivered at Shangri-La Dialogue in Singapore, 2 June 2017, https://www.pm.gov.au/media/2017-06-02/keynote-address-16th-iiss-asia-security-summit-shangri-la-dialogue. 4. Julie Bishop, “Global Heads of Mission Meeting,” speech delivered in Canberra on 28 March 2017, http://foreignminister.gov.au/speeches/Pages/2017/jb_sp_170328.aspx. 5. Ibid. The 2016 Defence White Paper underlines that a “strong and deep alliance is at the core of Australia’s security and defence planning.” See Department of Defence, 2016 Defence White Paper, 121, http://www.defence.gov.au/whitepaper/docs/2016-defence-white-paper.pdf . 6. See Peter Edwards, “The Foreign and Defence Policies of Robert Menzies: 50 Years On,” The Strategist, January 28, 2016, https://www.aspistrategist.org.au/the-foreign-and-defence-policies-of-robert-menzies-50-years-on/. 7. See Allan Gyngell, Fear of Abandonment: Australia in the World Since 1942 (Carlton: La Trobe University Press and Black Inc, 2017), Ch. 1. 8. James D. Morrow, “Alliances and Asymmetry: An Alternative to the Capability Aggregation Model of Alliances,” American Journal of Political Science 35, no. 4 (1991): 904-933; Darren J. Lim and Zack Cooper, “Reassessing Hedging: The Logic of Alignment in East Asia,” Security Studies 24, no. 4 (2015): 696-727. 9. Embassy of Australia (United States of America), “Australia and the United States – First 100 Years of Mateship,” http://usa.embassy.gov.au/files/whwh/Mateship-First100yrs.pdf. 10. Glenn Snyder, “The Security Dilemma in Alliance Politics,” World Politics 36, no. 4 (1984): 467. 11. See Zack Cooper and Alexander Lanoszka, “Abandoned Yet Entrapped? Allied Fears During the Trump Administration,”, paper prepared for the 2017 International Studies Association Conference, February 2017. Also see Mira Rapp-Hooper, “A Tale of Two Allies: Why Japan and Australia See Two Different Trumps,”, War on the Rocks, February 20, 2017, https://warontherocks.com/2017/02/a-tale-of-two-allies-why-japan-and-australia-see-two-different-trumps/; Michael Wesley, “Australia’s reactions to Trump,” ANU College of Asia & the Pacific, April 24, 2017, http://asiapacific.anu.edu.au/trump-100-days/australias-reactions-trump. 12. Allan Gyngell, Fear of Abandonment. 13. See, for instance, Peter Dean, “Australia and the United States in Asia,” in Peter Dean, Stephan Frühling, and Brendan Taylor, eds., Australia’s American Alliance (Carlton: Melbourne University Publishing, 2016), 262; Brendan Taylor, “Why Australia’s Defence Capability Without ANZUS is Greatly Overrated,” Australian Financial Review, February 6, 2017, http://www.afr.com/opinion/why-australias-defence-capability-without-anzus-is-greatly-overrated-20170205-gu5rpq#ixzz4mWFXQ5gN. 14. Andrew Burrell, “Kim Beazley back with a word of warning on Donald Trump,” The Australian, March 26, 2016. On Trump’s approach to foreign policy more generally, see John Ikenberry, “The Plot Against American Foreign Policy,” Foreign Affairs 96 (May/June 2017): 2-9; Alex Ward, “’America Alone’: Trump’s Unilateralist Foreign Policy,” War on the Rocks, May 31, 2016, https://warontherocks.com/2016/05/america-alone-trumps-unilateralist-foreign-policy/. 15. James Bowen, “Trump-Turnbull Meet Comes Amid Increasing Debate Over Australia’s US Ties,” The Diplomat, May 5, 2017, http://thediplomat.com/2017/05/trump-turnbull-meet-comes-amid-increasing-debate-over-australias-us-ties/. 16. Henry Belot, “Labor leaders call for careful rethink of US alliance, citing Donald Trump’s foreign policy,” ABC News, November 16, 2016, http://www.abc.net.au/news/2016-11-16/labor-leaders-call-for-careful-rethink-of-us-alliance/8029106. 17. Greg Sheridan, “Trump and Turnbull put Australia-US alliance back on track,” The Australian, May 6, 2017, http://www.theaustralian.com.au/opinion/columnists/greg-sheridan/trump-and-turnbull-put-australiaus-alliance-back-on-track/news-story/75432c8402d215692192542174196ee8. 18. Allan Gyngell, “Fighting with America: It’s How We Fight,” The Interpreter, December 20, 2016, https://www.lowyinstitute.org/the-interpreter/fighting-america-its-how-we-fight. 19. Stephen Walt, “Why Alliances Endure or Collapse,” Survival 39, no. 1 (1997): 160. 20. Hugh White, “With their threats to China, Trump and Tillerson are making rookie blunders that will only hurt US credibility,” South China Morning Post, January 17, 2015, http://www.scmp.com/comment/insight-opinion/article/2062762/their-threats-china-trump-and-tillerson-are-making-rookie. 21. Rachel Baxendale, “North Korea regime a threat to Australia, Malcolm Turnbull says,” The Australian, April 18, 2017, http://www.theaustralian.com.au/national-affairs/foreign-affairs/north-korea-regime-a-threat-to-australia-malcolm-turnbull-says/news-story/28c83e5a741a9e6d8013ad5074591dcb; Peter Baker and Choe Sang-Hun, “Trump threatens ‘fire and fury’ against North Korea if it endangers U.S,” The New York Times, August 8, 2017. 22. James Bowen, “Trump-Turnbull Meet Comes Amid Increasing Debate Over Australia’s US Ties,” The Diplomat, May 5, 2017, http://thediplomat.com/2017/05/trump-turnbull-meet-comes-amid-increasing-debate-over-australias-us-ties/. 23. Stéfanie von Hlatky, American Allies in Times of War: The Great Asymmetry (Oxford: Oxford University Press, 2013), 28. 24. Leigh Sales and Myles Wearring, “Paul Keating says Australia should ‘cut the tag’ with American foreign policy,” ABC News, November 11, 2016, http://www.abc.net.au/news/2016-11-10/keating-on-american-foreign-policy-after-trump-victory/8015028. 25. Hugh White, “Relying on Trump: Australia Needs to Rethink its Approach to Regional Security,” The Monthly, February 2017, https://www.themonthly.com.au/issue/2017/february/1485867600/hugh-white/relying-trump; Hugh White, “ANZUS in the Age of Trump,” The Strategist, December 1, 2016, https://www.aspistrategist.org.au/anzus-age-trump/. 26. Nick Bisley, “‘An ally for all the years to come’: Why Australia is not a Conflicted US Ally,” Australian Journal of International Affairs 67, no. 4 (2013): 403-418. On the benefits of remaining near the top of the US intelligence-alliance hierarchy, see Michael Wesley, “The Alliance as an Intelligence Partnership,” in Peter Dean, Stephan Frühling, and Brendan Taylor, eds., Australia’s American Alliance (Carlton: Melbourne University Publishing, 2016). 27. See ABC Fact Check, “Fact check: Does ANZUS commit the US to come to Australia’s aid, as Foreign Minister Julie Bishop claims?” ABC News, July 8, 2014, http://www.abc.net.au/news/factcheck/2014-07-08/does-anzus-commit-us-to-come-to-australias-aid-fact-check/5559288. 28. Angus Houston and Rory Medcalf, “The Unaffordable Price of Australia Abandoning ANZUS over Donald Trump,” Australian Financial Review, February 21, 2017, http://www.afr.com/opinion/columnists/the-unaffordable-price-of-australia-abandoning-anzus-over-donald-trump-20170220-gugqnp. 29. Mira Rapp-Hopper, “A Tale of Two Allies: Why Japan and Australia See Two Different Trumps,”, War on the Rocks, February 20, 2017, https://warontherocks.com/2017/02/a-tale-of-two-allies-why-japan-and-australia-see-two-different-trumps/. 31. Jacqueline Williams, “Malcolm Turnbull, Australian Leader, Pokes Fun at Trump in Leaked Recording,” The New York Times, 15 June 2017, https://www.nytimes.com/2017/06/15/world/australia/malcolm-turnbull-donald-trump-leaked-video-jokes.html. 32. Francis Keany, “US election: What Australian politicians have to say about Donald Trump and Hillary Clinton,” ABC News, November 9, 2016, http://www.abc.net.au/news/2016-11-09/what-australian-politicans-have-to-say-about-the-us-election/8007748; Paul Karp, “Trump the most ‘psychologically ill-equipped’ US president ever, says Gareth Evans,” The Guardian, April 13, 2017, https://www.theguardian.com/australia-news/2017/apr/13/trump-the-most-psychologically-ill-equipped-us-president-ever-says-gareth-evans. 33. Lowy Institute, 2017 Lowy Institute Poll, https://www.lowyinstitute.org/publications/2017-lowy-institute-poll. 34. Richard Wike, Bruce Stokes, Jacob Poushter, and Janell Fetterolf, “U.S. Image Suffers as Publics Around World Question Trump’s Leadership,” Pew Research Centre, June 26, 2017, http://www.pewglobal.org/2017/06/26/u-s-image-suffers-as-publics-around-world-question-trumps-leadership/. 35. Allan Gyngell, “Factoring Trump into the US-Australia Alliance,” East Asia Forum, February 13, 2017, http://www.eastasiaforum.org/2017/02/13/managing-trumpworld/. 36. “Mike Pence reaffirms ‘historical alliance’ between US and Australia in Turnbull meeting,” The Guardian, April 22, 2017, https://www.theguardian.com/us-news/2017/apr/22/mike-pence-to-meet-malcolm-turnbull-and-business-leaders-in-sydney. 37. Dan Lamothe, “In Australia Mattis and Tillerson Address Growing Concerns about American Isolationism,” The Washington Post, June 5 2017, https://www.washingtonpost.com/news/checkpoint/wp/2017/06/05/in-australia-mattis-and-tillerson-address-growing-concerns-about-american-isolationism/. 38. Paul McGeough, “Rex Tillerson cleans up Donald Trump’s mess in Australia, Japan and South Korea,” The Guardian, February 8, 2017, http://www.theguardian.com.au/story/4454173/rex-tillerson-cleans-up-donald-trumps-mess-in-australia-japan-and-south-korea/?cs=4172. 39. “US senators form ‘Friends of Australia’ caucus,” SBS Australia, May 9, 2017, http://www.sbs.com.au/news/article/2017/05/09/us-senators-form-friends-australia-caucus. Also see Dougal Robinson, “Congress Rallies Around Australia,” The Interpreter, February 9, 2017, https://www.lowyinstitute.org/the-interpreter/congress-rallies-around-australia. 40. Stephen Walt, “Why Alliances Endure or Collapse,” 166. 41. See Stephan Frühling, “Wrestling with Commitment: Geography, Alliance Institutions and the ANZUS Treaty,” in Australia’s American Alliance. 42. Sabra Lane, “Donald Trump likely to ask Australia to send ship to South China Sea: ex-Defence official Peter Jennings,” ABC News Australia, November 17, 2016, http://www.abc.net.au/news/2016-11-17/donald-trump-likely-to-ask-australia-to-gol-to-south-china-sea/8035660. See, e.g., John McCarthy, “Australia and the South China Sea,” The Strategist, March 17, 2016, https://www.aspistrategist.org.au/australia-and-the-south-china-sea/; Primrose Riordan, “Conservatives call for Australian response to China’s expansion in South China Sea,” Australian Financial Review, January 3, 2017, http://www.afr.com/news/politics/national/conservatives-call-for-australian-response-to-chinas-expansion-in-south-china-sea-20170103-gtlbnm; Donald Rothwell, “Freedom of navigation in the South China Sea: Australia must take a stand,” The Strategist, June 14, 2017, https://www.aspistrategist.org.au/freedom-navigation-south-china-sea-australia-must-take-stand/. 43. “Australia suspends air strikes in Syria after U.S. downing of Syrian jet,” Reuters, June 20, 2017, https://uk.reuters.com/article/uk-mideast-crisis-syria-australia-idUKKBN19B0GS. 44. It has recently been suggested that the relationship with China is becoming its own independent pillar of Australian foreign policy. Graeme Dobell, “Australia-East Asia/US Relations: Turnbull, TPP, and Trump,” Comparative Connections 18, no. 2 (2016): 146. 45. Greg Earl, “Economic diplomacy brief: TPP 11 vs RCEP, Asian banks and economic nationalism,” The Interpreter, June 1, 2017, https://www.lowyinstitute.org/the-interpreter/economic-diplomacy-brief-tpp-11-vs-rcep-asian-banks-and-economic-nationalism. 46. Jane Perlez, “U.S. Casts Wary Eye on Australian Port Leased by Chinese,” The New York Times, March 20, 2016, https://www.nytimes.com/2016/03/21/world/australia/china-darwin-port-landbridge.html. 47. David Uren, “Free Investment Pass for Foreign State Firms,”, The Australian, March 30, 2017, http://www.theaustralian.com.au/national-affairs/treasury/free-investment-pass-for-foreign-state-firms/news-story/63fe6ce89b9e511e0e32e989d11c67c2. 48. See Darren J. Lim and Zack Cooper, “Reassessing Hedging,” 696-727. 49. Greg Raymond, “A revived Quad won’t help Australia,” The Interpreter, June 23, 2017, https://www.lowyinstitute.org/the-interpreter/revived-quad-wont-help-australia. 50. Nick McKenzie, Chris Uhlmann, Richard Baker, and Sashka Koloff, “Australian sovereignty under threat from influence of China’s Communist Party,” ABC News Australia, June 6, 2017, http://www.abc.net.au/news/2017-06-04/australian-sovereignty-under-threat-from-chinese-influence/8583832; Andrew Greene, “Chinese spies ‘very active’ in Australia, departing defence secretary warns,” ABC News Australia, May 12, 2017, http://www.abc.net.au/news/2017-05-12/chinese-spies-very-active-in-australia-dennis-richardson-says/8522870; “Meddle Kingdom: Australia Battles Chinese Political Influence,” The Economist, June 15, 2017, https://www.economist.com/news/asia/21723454-it-will-be-uphill-struggle-australia-battles-chinese-political-influence. 51. See, e.g., Merriden Varrall, “A Chinese Threat to Australian Openness,” The New York Times, July 31, 2017, https://www.nytimes.com/2017/07/31/opinion/australia-chinese-students.html; Mark Thomson, “The Wickedness of China,” June 8, 2017, The Strategist, https://www.aspistrategist.org.au/the-wickedness-of-china/; Peter Hartcher, “China has defied the rules with impunity,” Sydney Morning Herald, June 6, 2017, http://www.smh.com.au/comment/china-has-defied-the-rules-with-impunity-20170605-gwkphb.html; John Fitzgerald, “Why Values Matter in Australia’s Relations with China,” The ASAN Forum 2, no. 3 (June 13, 2014), http://www.theasanforum.org/why-values-matter-in-australias-relations-with-china/. 52. Andrew Greene, “Foreign Minister Julie Bishop delivers warning to China on need to embrace democracy,” ABC News Australia, March 14, 2017, http://www.abc.net.au/news/2017-03-14/julie-bishop-warns-china-on-need-to-embrace-democracy/8350968. 53. Lowy Institute, 2017 Lowy Institute Poll, https://www.lowyinstitute.org/publications/2017-lowy-institute-poll. Note, however, that the same poll reveals some confusion within the Australian public, with 79 per cent considering China to currently be an “economic partner”, rather than a “military threat.” See Merriden Varrall, “Australians’ views of China: we need to go deeper than ‘fear and greed,’” Canberra Times, July 4, 2017, http://www.canberratimes.com.au/national/public-service/australians-views-of-china-we-need-to-go-deeper-than-fear-and-greed-20170702-gx2vbu.html. 55. Rory Medcalf, “China doesn’t hold the economic leverage over Australia that most people think,” Australian Financial Review, March 27, 2017, http://www.afr.com/opinion/columnists/china-doesnt-hold-the-economic-leverage-over-australia-that-most-people-think-20170326-gv6ldu. 56. Briana Shepherd, “Julie Bishop says China’s objection to Taiwanese delegates at Perth meeting was ‘regrettable,’” ABC News Australia, May 3, 2017, http://www.abc.net.au/news/2017-05-03/china-objects-to-taiwanese-delegates-in-perth-diamond-meeting/8494370. 57. See, e.g., Ashley Townshend, America First: US Asia Policy under President Trump (Sydney: United States Studies Centre, 2017); David Brewster and Anthony Bergin, “India takes an unsentimental view on Trump—and Australia should too,” The Strategist, March 23, 2017, https://www.aspistrategist.org.au/india-takes-unsentimental-view-trump-australia/. 58. See, e.g., Anthony Milner, “Australia may need a post-America foreign policy Plan B,” Australian Financial Review, October 25, 2016, http://www.afr.com/news/world/asia/australia-may-need-a-postamerica-foreign-policy-plan-b-20161025-gsa673. 59. Ian Hall, “The Australia­­–India–Japan trilateral: converging interests… and converging perceptions?” The Strategist, March 17, 2017, https://www.aspistrategist.org.au/australia%C2%AD%C2%AD-india-japan-trilateral-converging-interests-converging-perceptions/; C. Raja Mohan and Rory Medcalf, “Delhi, Tokyo, Canberra,” The Indian Express, February 10, 2017, http://indianexpress.com/article/opinion/columns/tpp-donald-trumpmalcolm-turnbullphone-call-leak-islamic-state-canberra-delhi-tokyo-4516471/. 60. Rekha Bhattacharjee, “Exercise Malabar shadow over Japan-Australia-India Trilateral Dialogue,” Indian Down Under, May 1, 2017, http://www.indiandownunder.com.au/?p=8789. 61. Euan Graham, “Missed opportunities at the Australia-Japan summit,” The Interpreter, January 16, 2017, https://www.lowyinstitute.org/the-interpreter/missed-opportunities-australia-japan-summit. 63. Graeme Dobell, “Australia-East Asia/US Relations,” 149; William Tow, “President Trump and the Implications for the Australia– US Alliance and Australia’s Role in Southeast Asia,” Contemporary Southeast Asia 39, no. 1 (2017): 53. 64. Jane Wardell and Jonathan Barrett, “Silk roads and chilled beef: how China is trying to fill a Trump vacuum in Australia,” Reuters, March 29, 2017, http://www.reuters.com/article/us-australia-china-politics-idUSKBN1700KN. 65. “One Belt One Road: Australia ‘sees merit’ in China’s new Silk Road initiative,” ABC News Australia, March 14, 2017, http://www.abc.net.au/news/2017-05-14/ciobo-sees-merit-in-chinas-new-silk-road-initiative/8525440. 66. Chrystia Freeland, “Address by Minister Freeland on Canada’s foreign policy priorities,” speech delivered in Ottawa, Canada, June 6, 2017, https://www.canada.ca/en/global‑affairs/news/2017/06/address_by_ministerfreelandoncanadasforeignpolicypriorities.html. 67. Allan Gyngell, “Australia’s foreign policy challenges,” speech delivered on April 13, 2017, http://www.anu.edu.au/news/all-news/speech-allan-gyngell-outlines-australia’s-foreign-policy-challenges. 68. Merriden Varrall, “Does China’s rise threaten the rules-based order?”, The Interpreter, June 7, 2017, https://www.lowyinstitute.org/the-interpreter/does-china-rise-threaten-rules-based-order. 69. John Ikenberry, “The Plot Against American Foreign Policy,” 5; Jessica T. Mathews, “What Trump Is Throwing Out the Window,” New York Review of Books, February 9, 2017, http://www.nybooks.com/articles/2017/02/09/what-trump-is-throwing-out-the-window/; Rob Taylor, “Australia Backs WTO as Trump Calls for U.S. Trade Shift,” The Wall Street Journal, March 2, 2017, https://www.wsj.com/articles/australia-backs-wto-as-trump-calls-for-u-s-trade-shift-1488448417. 70. Colum Lynch, “White House Seeks to Cut Billions in Funding for United Nations,” Foreign Policy, March 13, 2017, http://foreignpolicy.com/2017/03/13/white-house-seeks-to-cut-billions-in-funding-for-united-nations/. 71. Brendan Thomas-Noone, “Canada, Australia and the liberal international order in the Trump era,” The Interpreter, June 27, 2017, https://www.lowyinstitute.org/the-interpreter/canada-australia-and-liberal-international-order-trump-era. 72. Peter Nadin, “The shape of Australia’s future engagement with the United Nations,” Lowy Institute, March 31, 2017, https://www.lowyinstitute.org/publications/shape-australia-s-future-engagement-united-nations. 73. Alex Oliver, “Australia’s flatlining foreign affairs budget,” The Interpreter, May 10, 2017, https://www.lowyinstitute.org/the-interpreter/australia-s-flatlining-foreign-affairs-budget. 74. Penny Wong, “Australia’s National Interests in a Time of Disruption,” speech delivered at the Lowy Institute, Sydney, July 6, 2017, https://www.pennywong.com.au/speeches/australias-national-interests-in-a-time-of-disruption-lowy-institute-sydney/. 75. As Alan Tidwell reminds us, both the executive and Congress are directly involved in different aspects of US foreign policy development. “The Role of ‘Diplomatic Lobbying’ in Shaping US Foreign Policy and its Effects on the Australia-US Relationship,” Australian Journal of International Affairs 71 no. 2 (2017): 184-200.